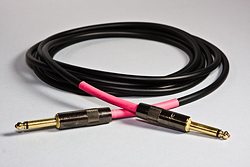 Our Premiere IC00 GS6 are Instrument Cables made with 18 gauge Canare GS-6 instrument cable and come standard with straight G&H Copper Core Gold tip 1/4" connectors (90 degree plugs are optional). This cable offers bass players, guitar players and Keyboards a fuller range signal with more high end presence and greater clarity. There is still all the bottom end you want just with better clarity.